I subscribe to many food blogs that post yummy, amazing recipes several times a week. Sometimes I even bookmark (Pin) one. I think to myself "my kids would love this one, oh and this one, and this". With such an onslaught of perfect recipes it's easy to fall into the trap of feeling guilty because let's face it - when it comes to reality, you're not going to make a new recipe every day, or every week even. Hey, I have times where all month long I make nothing new and it's pure survival mode in the kitchen. You know those times when you just don't feel the inspiration to make something new? When you simply have no time to invest in trying a new recipe? When it's pasta and hot dogs, with side of ketchup for dinner. We are so spoiled. Food network. Gourmet restaurants. Organic this, organic that. Right now as you're reading this, there are children searching for food at the dump somewhere. That really puts it in perspective, doesn't it? I have to remind my own kids of this, because sometimes I am the one spoiling them by making something they request to eat. Overall, I make and share easy recipes. I try to keep it basic. 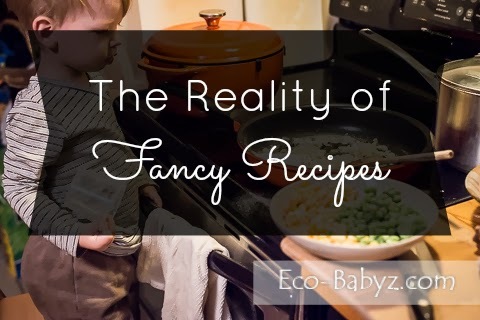 Even then, most of the recipes you'll see on that page I've made less than a handful of times because as a work-at-home mom I just don't have the time for many of them. Lazy chicken is a favorite - and not because I'm lazy, but because it's quick for when time is of the essence. I've stopped making homemade bread a while ago. We do still make birds-in-a-nest, fried plantains, and sprouted crust mushroom pizza. That's as special as it will get, usually once a week. The rest is just large batches of soup for lunch, chicken with alternating sides, and yes, even some things from the freezer aisle at Trader Joe's. But hey, at least the bulk of our diet is healthy stuff from scratch, even if it isn't fancy. Even if it's [gasp!] boring. I make cookies often, and secretly envy those that just buy them. I make pancakes from scratch because I can't justify buying a mix for some odd reason. But I make them when our breakfast routine of omelette, oatmeal, or bread/butter/cheese, just gets too repetitive. Yesterday I made cake on a whim. From scratch everything cake. For no reason, no occasion, other than having a pack of Stonyfield organic heavy whipping cream in my fridge that I wanted to use while it's still fresh. I made it just because I know how much my kids LOVE freshly whipped cream, and what better way to eat it than on cake. For the record, when there is a special occasion I make this cake without much desire, I almost force myself. I'm not good at it. Yesterday I did not want to make it, but I enjoyed seeing my children's faces light up as I made it and as they ate it. But that's so rare! Most days I just need to feed them without spending all day in the kitchen. Even when that's how I do it, I still feel like I'm in the kitchen too long making breakfast, lunch, and dinner. It's surreal right now how I took it for granted as a teenager. Knowing I can come into the kitchen and my mom always had something ready for us to eat. Wow, that was such a luxury. Now I'm providing that luxury to my children, my husband. I feel blessed to be the one providing it for them, but sometimes it just gets so repetitive. I need a reminder that it's just food and doesn't need to be fancy all the time. So, sorry food bloggers, but I just may unsubscribe from a few of your lists because the recipes you post are just too time consuming and make me feel unnecessarily guilty. Don't worry, I'll probably still find you on Pinterest if I need to when culinary inspiration strikes! Do you ever feel stuck in a rut in the kitchen? Do you feel the pressure to make fancy recipes for your family? We are involved in the work of the missionary society called gospel for Asia, GFA. They are doing great work in India reaching the lost. Hundreds of people are coming to Christ and then those same converts sacrificing their lives to reach the lost there. I have been seing a great shift in the missionary world. Whereas America used to be the one to send and have great fruit, it s now the locals of those countries that bare great, great fruit. The Lord is accomplishing His work through the people who have nothing, that live in scum while we here indulge in our luxury. Very little of what America sends out bares fruit anymore when it comes to missionaries. Majority of missionaries go to other countries to live a luxury life even having servents and maids. I read about one Indian family in India with 2 small kids, their dad was so on fire for the gospel he used every little cent to buy a track or a bible for the lost. One time he didn't have any money for food to feed his kids for 4 days because he thought the souls of the Lost and the gospel of Christ has much priority then food. 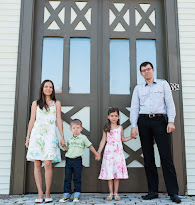 So he closed the windows of his home so the naighbours don't hear his kids cry LEST they profane the name of Christ. And there are many, many more like that, that no one ever finds out and they die. Our brothers and sister labor for the name of Christ, while we sit here and pick out recipes. Now, a lot of the locals can't even go because they do not have money. The Lord gave us money in this country. Not for our selfish pursutes but for His kingdom. When we see our family in Christ in need and we simply pass by, what does it say about our faith? Didn't Christ say 'come into my kingdom' to those that gave their coat to their brother and sister as though for Him? Something really strange is happening here. God gives us money, we care very little about His work, we use it for ourselves - but He is still saving hundreds. I am noticing that America is starting to play very little in the growth of Christ's name and that is SCARY because that means judgment. Unless Christian people wake up in this country and realize that every dollar God give us is NOT for us and live to spread God's Gospel, great and horrible events will visit us. I am reminded of Sodom and Gamora. One of the reasons for their judgment was that they ate too much bread. I don't mean to be preaching on your site. I was happy to see your post that the Lord is doing great work amongst His people and turning us away from the world. Lets evaluate every dollar we spend for it is not ours. I just bought some organic icecream, 10 bucks! That's almost half of how much a missioanry in India need to go and reach the lost! I think I can sacrifice my desires and live a humble life so that His name may be great. The task was given to us all. Just because we are not in jail or hungry doesn't mean we are not called to live in such a way as 'though we are the ones that are in jail with them' (quoting the bible here). May the Lord grant us eyes to see and ears to hear. Thank you for sharing your thoughts Julz! You're right, it's really easy to lose that perspective when day in and day out we live in luxury, even many who are considered 'poor' here have much more than poor people in other countries. I think overeating is a huge problem here, and I'm not even talking about obese people, just the average American portion is an amount people would never consider eating in one meal in European countries or anywhere in the world. When I tell someone that I stretch out a package of 6 chicken drumsticks for our family of 4 for two or even three days, they are really surprised. But I still have that mentality I guess from Soviet Union, that meat is expensive (and it is now!) and needs to be served in little portions. In many countries people don't even eat meat once a week! It IS a luxury - and here it 'must' be served with every meal. On a positive note, I do see many people waking up to this. Buying less, eating less, and wasting less (and not for loosing weight). Don't even get me started on how horrible I feel when something spoils and I have to throw out food, ugh. I can completely relate! One of the hardest things for me to accept after having my baby last year is that I can no longer spend 2-3 hours cooking and baking. 1 hour recipes now can take up to 3 hours. I hear ya! That's right, every recipe takes me 2-3 times longer! Yesterday I had to stick them in front of a cartoon just so I could make muffins and have them ready in time for after dinner - otherwise they wouldn't be ready until it's time for bed! Perhaps im a food addict when it comes to try new recipes, leaving MA, my brothers miss my "something new" when it comes to cooking, unlike mom's soup and potatoes. Having a large bulk of meat and ground meat, you just have to be creative, meatballs and plain ground beef just won't cut it for us. Having a crock pot on the other hand is very handy for busy days. Unfortunately i cook soups only once or twice a week because besides me and my younger one refuse to eat soup unless its fresh and something new. It's funny when i cook some of my favorites and my hubby would say "Soup again" or else lol. Maybe we are spoiled, at least i know my husband is no leftovers please, unless i force him to take it. I do agree that some recipes take too long to make but perhaps its one of those days when i feel like spending time in the kitchen and try something new, but deff come back to my favorites. There are recipes i try and never cook them again, recipes i add a little of my own and recipes that are traditional i cook even if only me would eat it =) But i always stick to leftovers until they are gone! Don't get me wrong, I LOVE trying new recipes. Culinary arts class in college was my favorite! I remember when I learned to flip crepes in the air, it was fun, and then tasting all the exquisite recipes the chef assigned was awesome! BUT I'm just the one who can't do it when kids are thrown in the picture. I always spend two hours on a one hour recipe and just don't have that kind of time luxury since I work 35+ hours a week. I love having relatives that are great cooks! :) I have a few!